Damson gin is very easy to make and provides a warming liqueur to drink on a cold winter’s night. The eventual flavour will vary according to the fruit, of course. 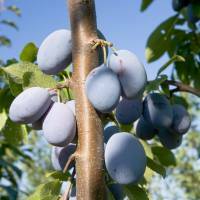 Ideal damsons for damson gin will be the same that work well in jams. You will need wide-necked jars for the damson gin. Large Kilner style are ideal but we’ve actually made it in an old-fashioned glass sweet jar which had a screw-top, well-fitting lid. Ideally you want your jar to be full with very little air-space at the top. If your damsons don’t fill the jar and you add more, note the weight added and alter the sugar content to match. This isn’t critical, the sugar is purely a flavouring rather than a basis for fermentation or to preserve the liqueur. Apologies for mixing up English and Metric measures but most spirits now come in litre bottles. Pick sound, ripe damsons, better slightly over-ripe than under. Remove any stalks and wipe with a damp cloth. Prick each damson 9 times with a scalded darning needle or wooden toothpick / cocktail stick. There is no need to stone the damsons. Place a layer of damsons in the jar, sprinkle with sugar. Repeat until the jar is full. Slowly pour the spirits over, gently rolling the jar to dislodge any air bubbles. Allow a little time for the spirits to settle and continue topping up until the damsons are well covered. Place the jar in dark place, not too cold or hot. We keep it in a Welsh dresser in the living room. Initially shake a couple of times a day for the first week, topping up with spirits if required. Thereafter, give the jar a gentle roll once a week. After 3 months or longer, strain the liqueur through muslin and bottle. The longer you leave it, the better the flavour. Some old recipes recommend a year minimum before bottling. You can add additional flavourings. A few cloves or half a cinnamon stick, a few drops of almond essence, a chopped chilli pepper or a teaspoon of dried chilli. Some people prefer to use half the sugar we did, some prefer more. I found it too tart with less sugar but that’s not a problem as you can add extra sugar prior to bottling. Just stir well to dissolve the sugar. Do not heat the liqueur to dissolve the sugar, you’ll evaporate the alcohol off! If making this with gin, a better quality gin makes for a better end result. If you’ve a glut of damsons and not got time to process them, pop in a plastic bag and keep in the freezer until you’ve time to handle them. Frozen damsons are fine for this liqueur. They will break down into a mush faster than fresh though. Use the rich alcoholic damsons as a pudding with cream, or as a cheesecake topper or an ice-cream ingredient. Don’t drive afterwards!